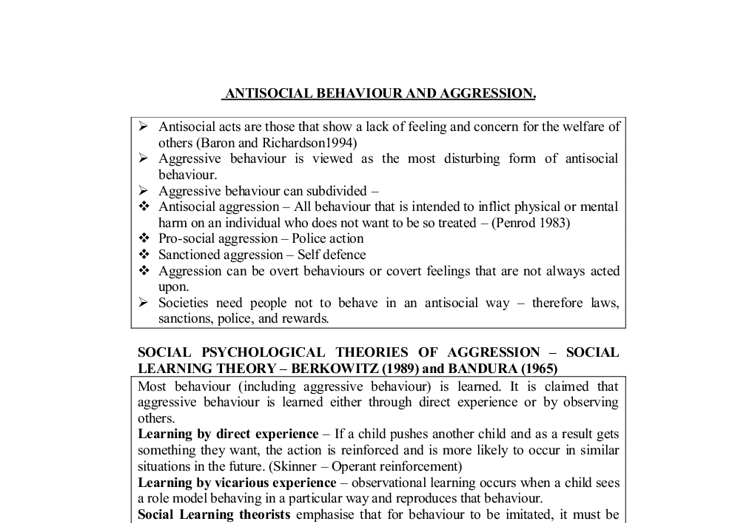 ANTISOCIAL BEHAVIOUR AND AGGRESSION. > Antisocial acts are those that show a lack of feeling and concern for the welfare of others (Baron and Richardson1994) > Aggressive behaviour is viewed as the most disturbing form of antisocial behaviour. > Aggressive behaviour can subdivided - * Antisocial aggression - All behaviour that is intended to inflict physical or mental harm on an individual who does not want to be so treated - (Penrod 1983) * Pro-social aggression - Police action * Sanctioned aggression - Self defence * Aggression can be overt behaviours or covert feelings that are not always acted upon. > Societies need people not to behave in an antisocial way - therefore laws, sanctions, police, and rewards. 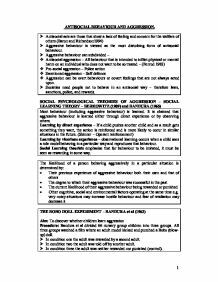 SOCIAL PSYCHOLOGICAL THEORIES OF AGGRESSION - SOCIAL LEARNING THEORY - BERKOWITZ (1989) and BANDURA (1965) Most behaviour (including aggressive behaviour) is learned. It is claimed that aggressive behaviour is learned either through direct experience or by observing others. Learning by direct experience - If a child pushes another child and as a result gets something they want, the action is reinforced and is more likely to occur in similar situations in the future. (Skinner - Operant reinforcement) Learning by vicarious experience - observational learning occurs when a child sees a role model behaving in a particular way and reproduces that behaviour. Social Learning theorists emphasise that for behaviour to be imitated, it must be seen as rewarding in some way. The likelihood of a person behaving aggressively in a particular situation is determined by: * Their previous experience of aggressive behaviour both their own and that of others * The degree to which their aggressive behaviour was successful in the past * The current likelihood of their aggressive behaviour being rewarded or punished * Other cognitive, social and environmental factors operating at the same time e.g. very noisy situations may increase hostile behaviour and fear of retaliation may decrease it THE BOBO DOLL EXPERIMENT - BANDURA et al (1963) ...read more. This suggests that people are not fully aware of the factors determining whether or not they behave in a pro-social manner. > Those participants who failed to report the emergency were not apathetic or uncaring. Most of them had trembling hands and sweaty palms. Indeed they seemed more emotionally aroused than those who did report the emergency. Evaluation: > This study does lack ecological validity. It was performed in a laboratory setting and the likelihood of people being in booths connected by a walkie - talkie system discussing college life is remote. > It is hard to apply these results to face to face bystander effects. BYSTANDER EFFECTS IN A NATURAL ENVIRONMENT. Latane and Darley (1970) found that when a person dropped books in a lift the probability of receiving help decreased with the number of people present. 40% were offered help when there was one other passenger, but only 15% when there were six others. Evaluation: Not all studies carried out in a natural environment have found that large numbers mean little helping. PILIAVIN et al (1969) Bystander effects in the natural environment Aim - to investigate the effects on helping of the type of person who is in need. Method - During a seven and a half minute journey on a busy New York subway train the 'victim' collapsed on the floor and remained there until someone helped. They looked at the effect on help offered of (a) The victim appearing ill or drunk and (b) The race of a person (black or white). The major findings are as follows - > Those appearing to be ill were more likely to be helped than those appearing to be drunk > The race of the 'victim' had little effect on the helping > The expected diffusion of responsibility effect did not occur. > Piliavin suggested that in lab studies participants could hear but not see the 'victim' whereas in this study participants could both see and hear the 'victim'. ...read more. Violence is presented as being an efficient way to getting what you want. 2. The person behaving violently is portrayed as similar to the viewer. 3. Violent behaviour is presented in a realistic way. 4. The suffering of the victim is not shown. 5. The viewer is emotionally excited while watching the violent behaviour. > Many studies are limited to simple investigations which are characterised by elements of artificiality. Some take place in a lab or 'natural' setting where the researcher has conspicuously manipulated some aspect of the viewing environment. Research participants are shown specially selected or recorded clips, which lack the narrative meaning present in everyday TV productions. > The lack of a firm theory that might explain why the media would have such effects has led to the effects model being based on a variety of assumptions (e.g. passive viewers). > Each of these assumptions is problematical and has exposed the failure of the media effects commentators to embed their model in any coherent theory > Nearly all research on the effects of media violence has been carried out in the United Kingdom or the United States. As a result, we do not really know whether findings would be the same in other cultures. > Individual differences could play a part. > It may be that people with aggressive personalities are more drawn to such programmes and therefore the observed effects of television violence are an effect rather than a cause of aggressive tendencies. > A second explanation is that only certain vulnerable individuals are affected by such violence. Most people can watch television without significantly increased aggressiveness. Evaluation of the effects of viewing violence: > There are moderating effects that could explain why the complex relationship between violence and the effect of viewing violent television programmes is often hard to establish. Brown and Pennell (1998) were interested not in whether television influenced violent behaviour, but in the reasons why it sometimes did and sometimes did not. * Groups of offenders and non-offenders were shown a violent film and then monitored over a 10 month period after the film. ...read more. In addition, a good theory, according to many philosophers of science, is falsifiable, able to be generalized, leads to new theories and ideas, and is recognized by others in the field. Clearly psychoanalysis meets many of these criteria. But Freud coined the term "psychoanalysis" in 1856. He became one of the best psychology writers, in a traditional behavioural approach, Skinner followed in the footsteps of Pavlov and Watson. B.F.Skinner is a behavioural psychologist who is most famous for his work with rats using the "skinner's Box". * 15 answer sheets, the 2 sets of 5 were both similar, one set has all the same fake high estimates and the other has all the same fake low estimates. The other 5 answer sheets consisted of no answers and the participants were told that they were the first asked in this study. Bower found that the group with the organised list remember 65% of the words were as the disorganised list could only remember 20%. This shows that organisation can improve recall. Hypothesis The aim of my coursework is to recreate the work of bower et al. Familiarity People become familiar with and tend to understand those with whom they regularly come in contact, including family members, peers, and coworkers. Mere exposure to one another frequently provides a foundation for attraction, and proximity matters. The more often one is exposed to another individual-even through photographs-the more likely one is to find the individual attractivel (Fiske, 2004). This essay will discuss the development of the ego, its functions and the formation of the self. In addition, the discussion will be lead into an evaluation of how positive and negative influences from the family and other social surroundings can have an impact on ego development.